But I’m deeply disappointed with the infantile “togetherness” that Israeli society and the Diaspora displayed throughout this overdrawn episode. I don’t think the “solidarity” and “togetherness” is anything to be proud of. If Israelis and Jews can only unite around such an inoffensive cause, their unity isn’t worth very much. It means the chances of building a workable majority for the difficult measures to achieve peace, rebuilding the economy, forging a just social structure and finally getting around to drafting a constitution are exceedingly slim. 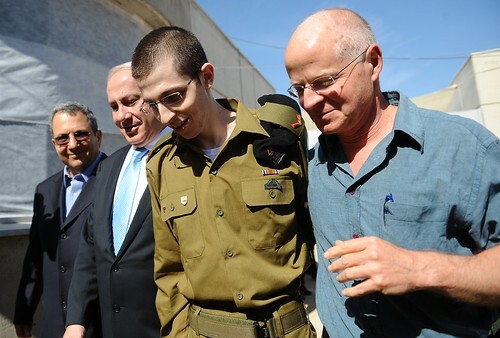 The Tzohar rabbis’ organization on Monday announced its support for the prisoner exchange deal securing the release of kidnapped soldier Gilad Shalit. “You did well. There are always those who oppose. If there is no opposition then it means that the deal is not good,” the rabbi said during a meeting with the prime minister. Shas’ spiritual leader, Rabbi Ovadia Yosef, says the release of kidnapped soldier Gilad Shalit is a sort of “preview” for the resurrection of the dead. In a sermon delivered Tuesday night ahead of the holiday of Simchat Torah, the rabbi explained that the joy over Gilad’s return to his family illustrates what the Jewish people should expect at the End of Days, when the dead will rise out of their graves and return to life. Now, the Knesset is scheduled to begin its winter session in a week’s time. The Trajtenberg committee recommended limiting state-funded studies at yeshivas for married men to no more than five years per student, cutting state funding for foreign yeshiva students, and forcing Haredi schools to teach the core curriculum. As for employment for haredim, the [Trajtenberg] report recommends that the state subsidize academic or vocational training for two-thirds of the men. But [Dr. Maya Choshen of the Jerusalem Institute for Israel Studies] believes that in Jerusalem, this will have little impact as long as the city can’t offer enough jobs. There are two problems with the education proposals for haredim in the report, he adds, one being the relatively low level of the colleges that offer separate tracks for haredi students compared to the universities, and the second is the intense competition on the market in these particular fields. A representative of the Defense Ministry said, Sunday, that a delay in the transfer of a 140-million-shekel supplement in budgets ending this year will put a stop to the Israel Defense Forces efforts to induct members of the hareidi religious community. Rabbanit Zigedon is one of the most successful moderators of a series of evening programs for women being offered lately in ultra-Orthodox and other religious communities. Yohanan is representative of what has come to be known in religious circles as the Ortho-prax, those who are outwardly pious members of a conservative religious group while privately eschewing their faith’s belief structure and rules. Because “the phenomenon is in essence secret” he tells me, he cannot know how many people in the community share his beliefs, but he estimates that it is quite small, no more than 0.1 percent of Israel’s haredi sector. This is due, he contended, to the fact that many of those who “are yearning for the outside world simply become secular” with the help of such organizations as Hillel and Keren Omer, which assist those who leave haredi society to transition into the Israeli mainstream. A sign at the ice cream parlour may caution men and women not to lick cones in public, but the warning didn’t stop Jewish zealots vandalising the shop in Jerusalem’s main ultra-Orthodox neighborhood. Other businesses in Mea Shearim, including a book store and dress shops, have been damaged in night-time attacks by Sikrikim, a group of some 100 ultra-religious men who want one of the holy city’s most tradition-bound quarters to become even more conservative. The Haredi community is mourning Rabbanit Batsheva Haya Kanievsky, who passed away suddenly on Saturday from heart failure in her Bnei Brak home at the age of 79. At least 50,000 people attended her funeral Saturday night, the Magen David Adom ambulance service estimated. “The threats were made by the Sicarii, a group known to the haredi public as problematic and violent people,” one of the deputy minister’s associates explains. In honor of the pilgrimage holiday of Succot, during which hundreds of thousands of people visited the Western Wall, activists demanded that authorities renovate a small section of the wall located in the Muslim Quarter of Jerusalem’s Old City next to the Temple Mount. The Kotel Hakatan (Small Wall) is believed to be the remaining structure of the Second Temple closest to the Holy of Holies. Long after its publication, the book Torat Hamelech continues to generate tremendous controversy. The book asserts that under certain circumstances Halacha (Jewish law) permits the killing of non-Jews, including civilians and young children, who might become killers of Jews at some future time. …Those who presume to issue halachic rulings today would do well to be guided by this ancient rabbinic insight and to remember that the Torah teaches mercy and righteousness, and not cruelty and harshness. Providing Torah scrolls for the army is one of the large-scale undertakings of The National Council of Young Israel, a mainstream Orthodox body, and the International Young Israel Movement’s Israel region. Last month its members dedicated a restored Torah scroll at the Sirkin army base near Petah Tikva. It was the 200th scroll donated to the IDF by Young Israel, and the first of a series of Torah scrolls that were rescued from the Holocaust. A huge Simchat Torah flag has been waved recently over the Eretz Israel Museum in Tel Aviv, announcing a new exhibition displaying holiday flags which have turned into collector’s items over the years, but also the changes the Israeli society has gone through. More than 10,000 people attended the first two days of the Succot celebrations at the Beit Orot Yeshiva on the Mount of Olives. The yeshiva, funded by Jewish-American businessman Irving Moskowitz on Tuesday, staged three days of events and activities during the festival’s intermediate days, attracting more than 10,000 visitors. More than 70,000 people on Sunday attended what appeared to be the biggest Priestly Blessing ever seen at the Western Wall. The crowd recited both the Morning Prayer and the Musaf Prayer. For Rabbi Amiel Keinan, the request that he teach a class of children at the Kfar Ganim Amit yeshiva in Petah Tivka who had been reassigned from the city’s Ner Etzion school, was like coming full circle. All of the children at Ner Etzion other than Keinan’s own son Ran were of Ethiopian background, and Ner Etzion was closed at the beginning of the current school year in an effort to integrate the students at other schools. The Bnei Menashe community of northeastern India is celebrating Sukkot this year thanks to the generous support of the Shavei Israel organization, which sent hundreds of sets of lulavim and etrogim from Israel to India prior to the onset of the holiday. In their festival prayers, the Bnei Menashe turn to face Jerusalem and offer a special plea to finally be allowed to make aliyah during the coming year. The Elad association has far-reaching administrative powers in Jerusalem’s City of David national park, according to an agreement, publicized here for the first time, between that organization and the Israel Nature and Parks Authority. Last week, two professors from the Blavatnik School of Computer Science at Tel Aviv University sat down to burrow through the tattered pages [of the Cairo Geniza]. But they weren’t searching through them physically: The pages appeared on the huge screen of a state-of-the-art Macintosh computer with a wireless keyboard and mouse. …The project was initiated by ultra-Orthodox millionaire Albert Dov Friedberg of Toronto, Canada, who wrote his doctoral thesis about Maimonides, the most notable person who prayed in Cairo’s Ben Ezra Synagogue. El Al may have to forgo flying 12,000 to 15,000 Nigerian Christian pilgrims due to security problems.